Interpret the ACE Study and its outcomes. Explain the connection between toxic stress, development, physiology and behavior. Consider the implementation of ACE screening in clinical practice. List and use trauma-sensitive practices at both the individual and organizational levels. Are you interested in becoming more involved with IAFP? Take your passion and knowledge about family medicine beyond your practice or medical school and volunteer for a committee, task force, or interest group! First, visit the IAFP Committee webpage where you can read descriptions about the wide variety of committee volunteer opportunities. Next, fill out the online sign-up form and indicate which committee(s) you are interested in joining. The deadline to sign up for the 2016 committees is March 18. Don't miss out on this great opportunity to help shape the future of family medicine! Questions? Contact Sara Ortega at[email protected]. Nominations are open FP of the Year. We have 2700+ active members throughout the state. 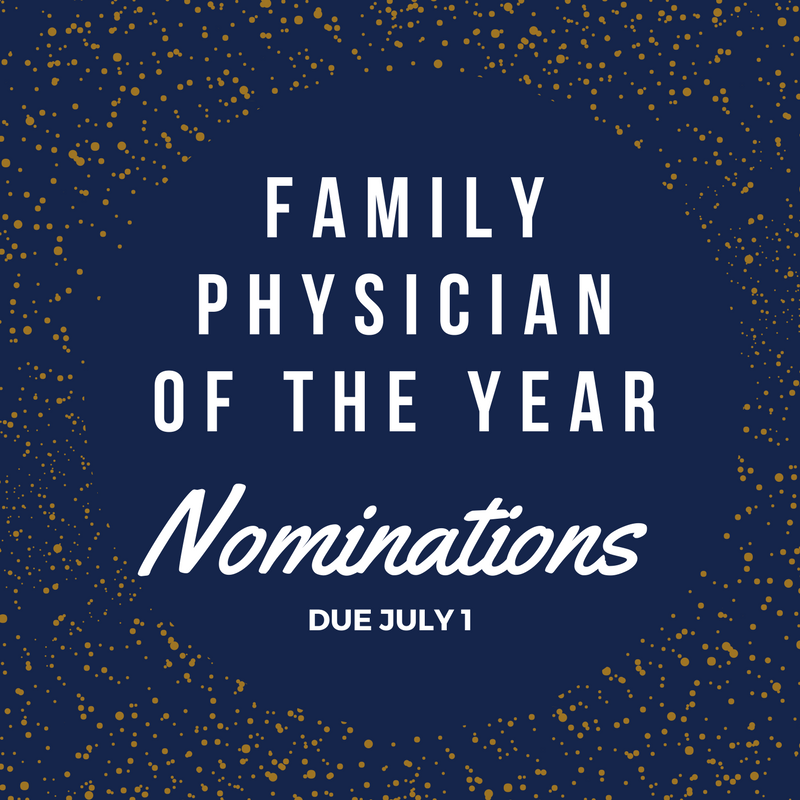 Do you know the next Illinois Family Physician of the Year? Submit that members name and information to IAFP by June 1using our easy form on the IAFP website. Be counted: complete the AAFP member census. The census results help chapters and AAFP better understand and represent the needs of our shared members. Essential Evidence Update Chicago - Register today! March 17-18 at the University of Illinois at Chicago. Earn 12.75 CME credits with topics across the spectrum of primary care! The new research evidence and meta-analyses that will either change your practice or confirm that your current approaches are supported by solid evidence from randomized trials and other high quality studies. Its one stop shopping for primary care excellence and CME. Learn more here - Online registration is now open! discounted registration for early career (less than 7 years post residency) and one-day registration option available! Healthy Hearts in the Heartland H3 Webinar on Blood Pressure:Michael Rakotz, MD, Director of Chronic Disease Prevention at the American Medical Association and a new member of the IAFP board of directors, presents a webinar discussion for providers and office staff on blood pressure (BP) control improvement methods on February 25thfrom 12:30-1pm. Get a great deal of information in only 30 minutes! Attend the Direct Primary Care Workshop in Detroit, MI, April 2, to get the answers you need. Receive dedicated face time from industry experts. Participate in small group, peer-to-peer learning sessions. And gain first-hand knowledge of the benefits and challenges involved with starting or converting your practice. Save $100 when you register by March 11. Earn up to 5.5 CME credits. Medical and legal experts will customize the day based on topics that are important to you. As an added bonus, every registration comes with a one-year, complimentary subscription to the DPC Toolkit. IAFP has posted some resources and common concerns and questions about Medicaid Managed Care Organizations on our Practice Managment page. Click here to view this new reosource. There is an urgent need to federally fund Teaching Health Centers in order to prevent the closure of over 60 programs! One of these programs is Northwester McGaw at Humboldt Park. These programs train family physicians prepared for and passionate about caring for the underserved. The American Association of Teaching Health Centers has launched theSaveOurTeachingHealthCenters.org web site that has all the tools you need to help support the continuation of these vital programs that work. Use your social media savvy or directly contact to your Illinois members of Congress. IAFP will be supporting this effort through our Twitter and Facebook platforms. The Physician Quality Reporting System, or PQRS, is a Medicare pay-for-reporting system requiring you to submit quality data to CMS. The reporting deadline is February 26, 2016 at 4 p.m. CT. If you do not report 2015 PQRS measures by this date, you will be charged a 2% penalty to your 2017 Medicare Part B payments. AAFP can help. They have partnered with PQRSwizard to offer members an easy-to-use reporting solution at a reduced price for both individual and group providers. Avoid the 2% penalty. Register now, and get started today. The Illinois Telehealth Initiative invites you to the inaugural Illinois Telehealth Law Forum, a three-part series examining the telehealth landscape in Illinois and the broader Midwest. Each of the three forums will provide excellent educational and networking opportunities for anyone interested or engaged in telehealth. The Illinois State Medical Society (ISMS) offers a FREE CME program on their web site (registration required). Another resource to share with your at-risk patients: Check out a simple 1-minute video co-branded by ISMS, IAFP and Illinois Osteopathic Medical Society. Find it all on theHepC Resources page on our web site. Healthy Hearts in the Heartland H3 is a QI project to improve cardiovascular outcome and prepare for value based payments. IAFP president Alvia Siddiqi, MD authored a letter to the editor in the Chicago Sun-Times on February 2 urging the Chicago City Council to pass a proposed ordinate that will add excise taxes to other tobacco products and raise the age to purchase any tobacco or nicotine product to 21. IAFP member Leslie Mendoza-Temple, MD of Evanston appeared live onChicago Tonight on January 25 in her role as chair of the Illinois Medical Cannabis Advisory board discussing the potential of adding more conditions eligible for cannabis prescriptions under the Illinois medical cannabis pilot program. IAFP member Charles Robacker, MD passed away on January 30. From 2005 to 2013 he was the Program Director for the Saint Louis University-Belleville Family Practice Residency then continued as Senior Faculty at the residency serving both Southern Illinois Health Care Foundation and Saint Elizabeths Hospital.